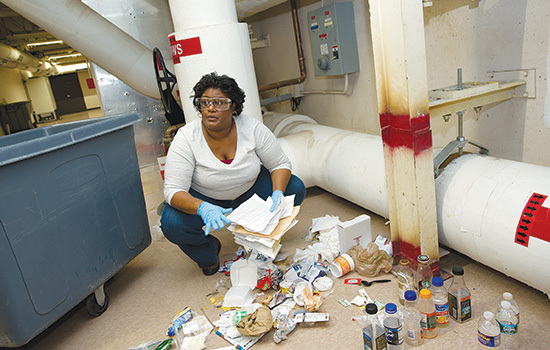 Archaeology assistant professor Martha Morgan demonstrates how she sorts through garbage to understand societal habits and behaviors. Martha Morgan believes that one man’s trash is another man’s treasure. In fact, Morgan, assistant professor of archaeology in the College of Liberal Arts, has focused much of her career studying just how meaningful garbage is to modern society, while at the same time answering important questions about cultures, habits and sustainability. Garbage archaeology was introduced by William Rathje, a former anthropology professor from the University of Arizona— and one of Morgan’s mentors. Throughout his graduate seminar, Rathje taught Morgan and his other students how studying refuse can lead to a greater understanding of their behaviors and societal engagement and to positive lifestyle changes. Today, Morgan has passed on those same messages to her students and impresses upon them the importance of studying consumption, waste and recycling, and the impact this has on individuals and societies. Throughout her course, Morgan asks her students to collect every ounce of their personal garbage for a one-week period. And she means everything—from used tissues to potato chip bags to unfinished pizza slices and soda pop. At the end of the week, students bring their trash to class to sort and catalogue every single item. Morgan acknowledges that there is a definite trend in studying garbage. She points to documentaries like Waste Land and Garbage Dreams that tell stories of the exorbitant amount of garbage that is created. She also notes that in the 1950s, there was a culture shift that enabled many products to become disposable. Today, 90 percent of what we produce ends up as garbage, she says. In addition to classroom lectures, Morgan takes her classes to the Monroe County Recycling Facility on Lee Road in Rochester to gain a greater understanding of what happens after garbage and recyclables are hauled away. Ultimately, Morgan hopes her lessons will teach her students how to be mindful of recycling and how much is consumed or tossed into landfills.